The information presented on this page was originally released on June 29, 2012. It may not be outdated, but please search our site for more current information. If you plan to quote or reference this information in a publication, please check with the Extension specialist or author before proceeding. “Everyone wants watermelon -- from the beginning of harvest in June right up until the Fourth of July, when demand peaks for holiday picnics,” said Rick Snyder, a vegetable specialist with the Mississippi State University Extension Service and Mississippi Agricultural and Forestry Experiment Station. “Mississippi has an ideal climate for many vegetables, and watermelons are one of those that thrive in the heat. They need a steady supply of water, but ideally the last few days before harvest will be dry so the sugar content will be high. “So this year, now that it’s been dry for several days in a row, the watermelons should be extra sweet,” he said. Wait a minute – watermelons are a vegetable? Snyder said watermelons could be classified as either fruit or vegetable, depending on the definition used. They are a fruit because they contain seeds and are the reproductive organs of the plants. They are a vegetable because they are from the cucurbit family; closely related to cucumbers, muskmelons, gourds and squash; and planted and harvested like vegetable crops. Whether they are fruits or vegetables, watermelons are in high demand, which is good news for the state’s producers, who experienced an earlier-than-usual crop this year due to the warm spring. According to a June 24 report by the U.S. Department of Agriculture, Mississippi’s watermelon crop was 42 percent harvested, 22 percent ahead of the same time last year. James Earnest of Prospect Produce Farm, located 3 miles south of Houston, said everything has gone well this year. He sold out of his watermelons within the first hour of business at a recent West Point Farmers’ Market. But he is concerned about the heat. While farmers across the state are concerned about the current lack of rain, most watermelon growers use irrigation, Snyder said. Snyder explained how consumers can tell when a watermelon is ripe. Gardeners and growers have two more ways to determine ripeness. “Look at the tendril or curl on the vine closest to the melon that you’re checking for maturity,” Snyder said. “If that tendril is dry, brown or black, it’s an indication that it’s ready. If it’s green, it is probably not ripe. “The third test is the ground spot, the part of the watermelon that is in contact with the ground. Roll the watermelon over -- careful not to break the attachment to the vine. If it’s still green or greenish yellow, it’s not ready. If it’s yellow, bright yellow or creamy yellow it’s probably ready,” Snyder said. If it is not ready to harvest, Snyder said gardeners should roll it back onto the existing ground spot. For home gardeners who wish they had planted watermelon, it’s not too late, said Wayne Porter, Extension horticulture specialist in Lauderdale County. “Why not plant some now for Labor Day? Typically you would plant early to mid-April, but it’s possible to start now. I recommend the old standard varieties -- 'Jubilee' and 'Crimson Sweet' are still good choices,” he said. 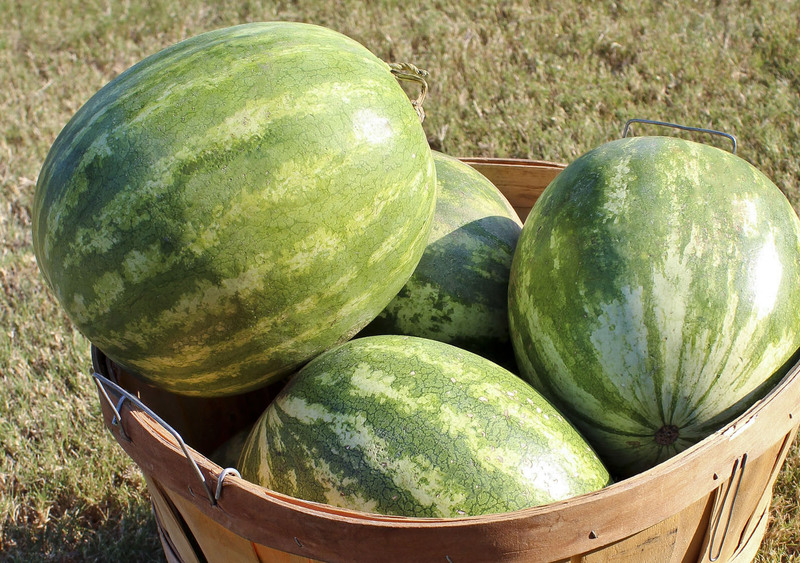 The 34th annual Mississippi Watermelon Festival will be July 20 and 21 in Mize, a small town in southwest Smith County, which includes a biggest watermelon contest.